Happy Hour at REVIVAL FOOD HALL, December 13th, 5-7pm! 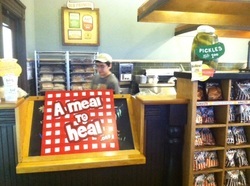 125 S Clark St.
Amealtoheal.org has been invited by Potbelly's to be a recipient of their 40th Year Anniversary fundraiser!! This is a nationwide fundraiser and we feel honored to be selected to participate in this special event! 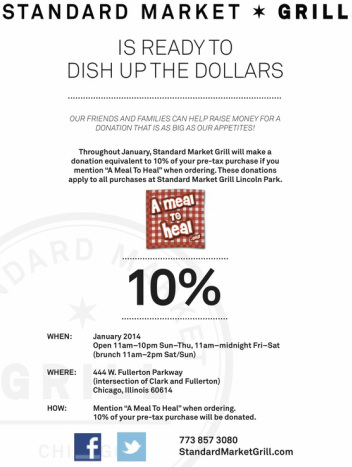 Stop by and say hello at this generous event hosted by Potbelly's!! We will be at REVIVAL FOOD HALL this Friday , Dec 9th, 2016- 11:30am - 1:30pm, 125 South Clark St., in Chicago's Loop! This massive 24,000 sq ft space hosts Chicago's best culinary scene under one roof! Stop by and say hello! 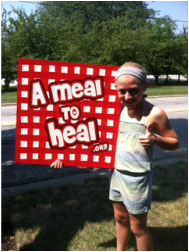 Join us on Thursday, August 18th at POTBELLY's in Lake Bluff, IL for a fundraiser from 4-7pm! Forest and Found, a local Lake Forest, IL community marketplace that donates proceeds to charities sponsored A meal to heal !!! 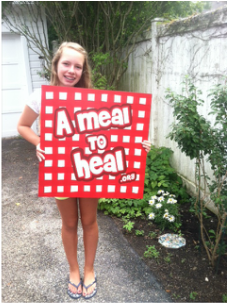 Amealtoheal.org would like to thank Forest and Found for a very generous donation of its 2nd Quarter proceeds!! Join us this Saturday , Feb 28th, at the Lake Forest West Train Station! We are excited to be featured in the October 2015 issue of MAKE IT BETTER MAGAZINE, a widely distributed magazine on Chicago's North Shore!! Stop by and say hello at this generous event hosted by Potbelly's Subs! This is the brand new location in Lake Bluff! Next to the new Target. 25% of all sales will be donated to Amealtoheal.org !! September 17-20! The Western Golf Association has generously provided 2 tickets to any day of the BMW Championship! Auction dates: Thursday July 16th - Sunday July 19th. Final bid due 5pm Sunday! Thank you for participating in THE BMW CHAMPIONSHIP and Amealtoheal.org virtual ticket auction! We had a great BMW Championship Ticket Auction - THANK YOU! LAKE FOREST BANK - 727 Bank Lane, downtown Lake Forest! Lake Forest Bank for their assistance in our successful event!! THANK YOU POTBELLY'S FOR A SUCCESSFUL AND FUN EVENT! WE HAD A GREAT TIME, GREAT MUSIC, AND OF COURSE GREAT SUBS!!! Please join us Saturday, April 12TH , at Vernon Hills Potbelly, between 5-8PM and our friends at POTBELLY'S will donate 25% of all sales to Amealtoheal.org!! 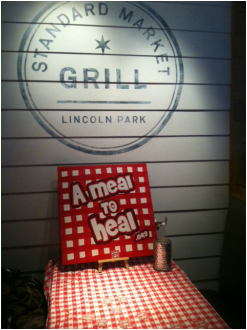 All month , 10% of sales at the LINCOLN PARK location will be donated to Amealtoheal.org! Just mention it to the cashier when ordering! THANK YOU TO ALL WHO QUENCHED YOUR THIRST AT OUR LEMONADE STAND!! IT WAS A 90+ DEGREE DAY AND A HUGE SUCCESS!! Also , thanks to Tess, Annie, Emma, Abbey, Eleanor for running the show!! Tuesday March 5th, 2013 !! Thank you for braving the blizzard to participate !! We had a great time and thank you to Gina and Javier of Authentico, and Lisa at Francesca's for your sponsorship! !